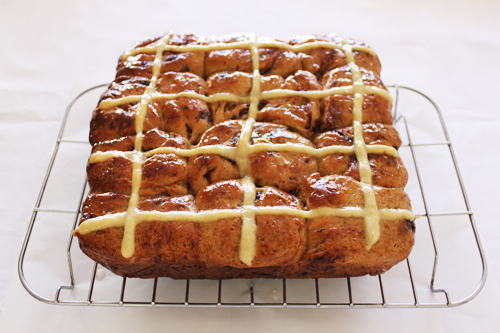 Every year when it gets closer to Easter I get so excited about hot cross buns. Bakeries start selling them months before it’s actually Easter, and hey, I’m not complaining. Over the years, it’s become less about the chocolate, and more about an excuse to get a proper present. That wasn’t always the case. My best memories of Easter would have to be when I was really young, around 5, and we would go to Rottnest for Easter every year. For those who don’t live in Perth, Rottnest is a small island off the coast of Fremantle (around 30-40 minutes away) that many take their boat or ferry over and holiday on the Island. Growing up, it was a regular family vacation spot. Now days Rottnest has kind of ‘sold-out’ and it’s too expensive to go there, not to mention hard to get accommodation. But back to my story. Mum and Papa would hide little Easter eggs all over the boat and my brother and I would spend the morning looking for them. It wasn’t the biggest boat so the hunt didn’t last long, but it was fun. The other week I decided for the first time ever to make hot cross buns myself, and to be honest, the first lot were a complete failure. The yeast didn’t activate so I was left with hard little ‘rocks’. Speaking to a friend at work, she suggested it was the environment wasn’t humid enough for the yeast. So taking her advice, I created a little cave for my dough to rise by putting the oven on really low, and letting the dough sit in a well grease bowl, covered with glad wrap (cling wrap) and then covered with a damp tea towel. Success! The dough was soft and silky and elastic. 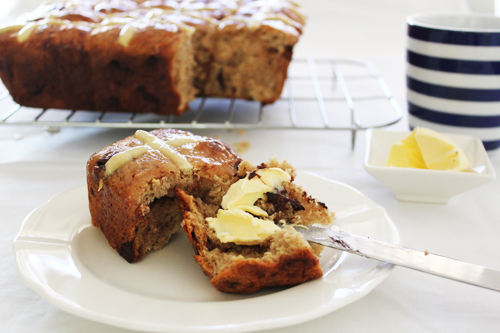 If you prefer to make the original hot cross buns (with fruit), instead of choc chips, use 1 cup sultanas, ½ cup raisins and 1/3 cup candied mixed peel. This recipe comes from the blog Grab You Fork, and you can find the original here. In a large bowl, add the yeast, milk and 2 teaspoons of the sugar, stir and set aside for 10 minutes until the yeast forms bubbles. In the same bowl, add the flour, cinnamon, butter, egg, choc chips and remaining sugar and mix well with a metal spoon to bring all ingredients together. You can use dough hooks on an electric mixer to do this as well. When it comes together, knead the dough for 10 minutes on a lightly floured surface until it becomes smooth and elastic to the touch. Lightly oil a clean bowl, and place the dough in the middle. Cover with cling film, then place a damp tea towl on top. Let the dough rest for 1 – 1 ½ hours in a warm area until it doubles in size. Line a 23cm square tin with baking paper and light grease with oil. Divide the dough into 12 even balls then place in tin. Cover the tin with cling film and place the damp tea towel on top. Leave dough to rest again for 30 minutes in a warm area. To make the crosses, mix the water and flour until you have a thick paste. Place in a piping bag (or plastic bag and snip end off) and slowly pipe crosses over the buns. Place the buns in the oven and cook for 25-30 minutes or until golden brown. You will know they are ready when they make a hollow sound when tapped. To make the glaze, add the sugar and water in a small saucepan over a low heat and stir until the sugar dissolves. In a small bowl, mix 1 tablespoon of cold water with the gelatine until it comes together. Add to the saucepan, along with the cinnamon and mixed spice and stir. Take off the heat and allow to thicken slightly. Brush the glaze over the hot buns. Oh yum - this looks (and likely tastes) amazing!! Thank you so much for your kind comment Gina! Thanks Natasha, I had a look at your blog and your photography is just beautiful!